Everyone knows that sun protection is a daily essential, especially in the summer. But what if this important part of your daily routine could actually be, dare I say it… glamorous? 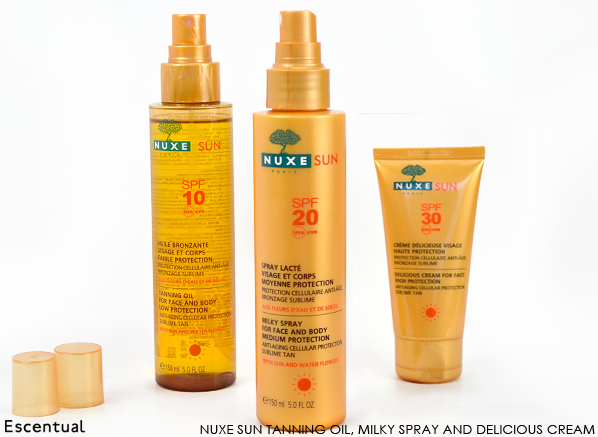 After years of research and formulation, the Nuxe Sun collection has launched, and it aims to be just that. 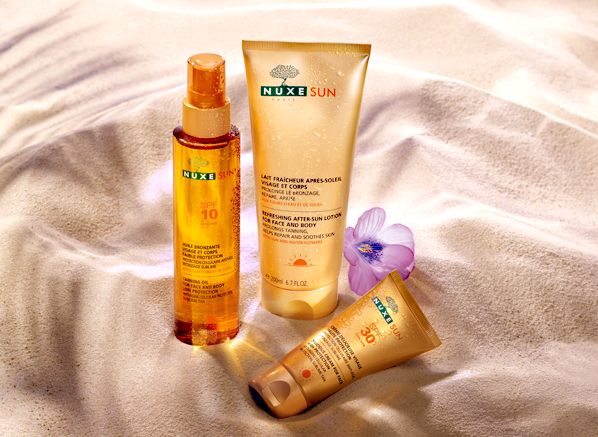 Nuxe created its long-awaited Sun range with a key purpose: to ensure that each new formula not only provides the protection that you need, but is also pleasurable enough to that you’d want to keep on reapplying right through the day, which is so important for adequate sun protection. The result is a capsule collection that spans different textures and SPFs to suit all types of sun exposure, enhanced with the addictive aroma of sun-warmed solar flowers and vanilla. The protective arm of the collection is comparatively small when sized up against most other pharmacy brands, but what it does have, it does very well. The smaller range also has the added advantage of making choosing the right product for you very simple. 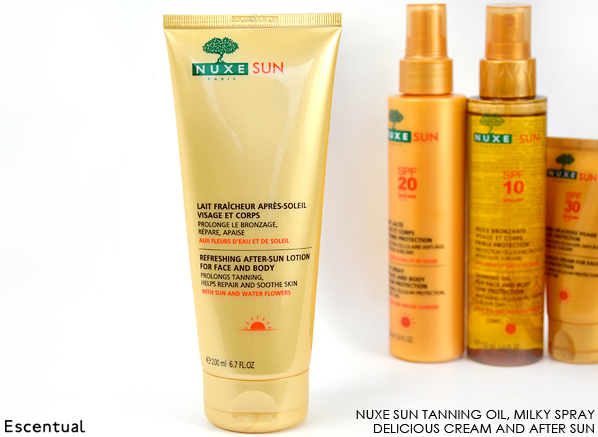 There are two products that offer universal sun protection for both the body and the face: the Nuxe Sun Tanning Oil SPF10, and the Nuxe Sun Milky Spray SPF20, plus a higher level of protection for the face: the Nuxe Sun Delicious Cream for Face SPF30. Now, the Tanning Oil’s SPF of 10 is something of a rarity in a dedicated suncare product (though quite common in make-up and skincare), as most tend to have a protection factor of at least 15. 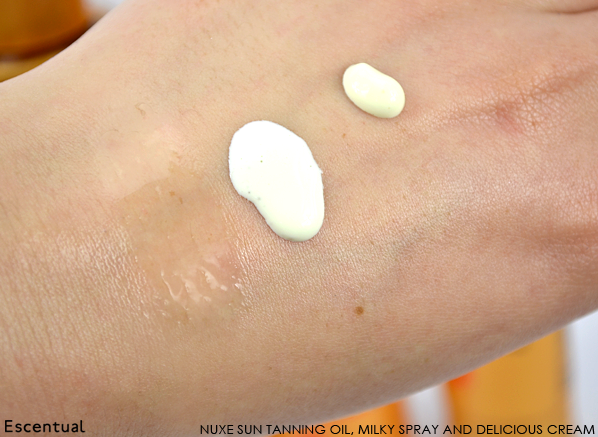 Nuxe maintains that this lower protection product should be used by those with already tanned or dark skin, and that reapplication every two hours is essential. If you’re pale and interesting, this isn’t the product for you! The higher protection Milky Spray for Face and Body with its SPF of 20 is suitable for most other skin tones, as is the Delicious Cream for Face, which offers the highest protection in the range to suit delicate complexions. Each of the products is formulated with the same cocktail of antioxidant ingredients, including patented Water Hyacinth to protect the skin from dehydration, Kau Pe Flower to relieve burning sensations, and carob seed powder, which stimulates melanogenesis and prolongs your natural tan. The difference between them lies in their texture, and their level of SPF protection. The Tanning Oil, seen above on the left, has a lightweight, moisturising finish that isn’t quite a dry oil, but isn’t greasy either. It’s formulated without silicones, alcohol or mineral oils, and makes your skin feel so satiny after use. The Milky Spray, seen above in the middle, is equally lightweight, spraying on in a fine mist that dries to a transparent finish. The Delicious Cream is a little richer, offering lasting moisture and protection without leaving a chalky cast. 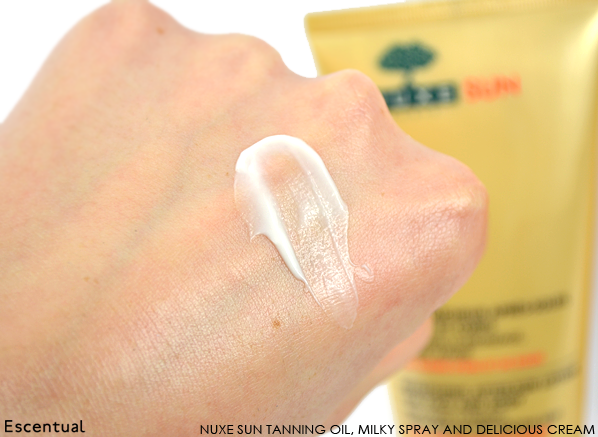 When you finish your fun in the sun, there’s the intensely soothing Nuxe Sun Refreshing After-Sun Lotion for Face and Body to come home to. Created to replenish lost moisture and soothe overheated sensations, it really does the trick on parched skin. Like the rest of the Nuxe Sun collection, it contains moisturising Water Hyacinth, soothing Kau Pe and a generous helping of carob seed powder to help prolong your tan for up to two weeks. The finish is predictably quenching, with lots of slip to glide over sore skin without tugging, and an instantly cooling feel (without menthol or alcohol, I hasten to add). Added sunflower oil and coconut extract add greatly to this melting texture, giving skin lots more flexibility and suppleness. Another trait that this after sun borrows from the rest of the collection is its absolutely delectable summer holiday fragrance of warm sand, plush white flowers and creamy vanilla. You’re completely forgiven if you wear this one as a daily moisturiser to bring on the feel-good summer vibes – I already am! Now closed! Congratulations to our winners Bel S, Laura C and Victoria H! Competition closes on Thursday 22nd May. Best of luck! No purchase necessary. A purchase will not improve your chances of winning. Contest begins 15th May 2014 and ends 22nd May 2014. Winners will be selected in a random drawing on or about 23rd May 2014. Three prize winners will receive the items stated above. If the winner doesn’t respond within 7 days, the competition will be redrawn. Prizes must be accepted as awarded; not redeemable in cash or credit. This entry was posted on Thursday, May 15th, 2014 at 9:00 am and is filed under Sun and Tanning, Tried & Tested. You can follow any responses to this entry through the RSS 2.0 feed. You can skip to the end and leave a response. Pinging is currently not allowed. Venice, I would love to go back! love tunisia, the people, food and weather makes it a great place! I’d love to go to the Maldives. I would love to go to the Carribean or florida with the children! Darwin Australia, My Niece lives there and it looks stunning although very Hot! I’d love to go to Trinidad and Tobago. A friend went there on her hols once and loved it so much, she named her house Tobago! Japan. Always wanted to go. My dream holiday would have to be Seville, Spain or somewhere like Capri in Italy. Alaska – probably wouldn`t need much sunscreen! I would love to go to Australia. Fiji… i probably will never make it there unless a lottery win turns up! Maldives would be the dream holiday before the islands sink forever. My dream holiday destination would be for my husband and I to drive Route 66 in the States! My Dream destination would be Monaco, for the grand prix. 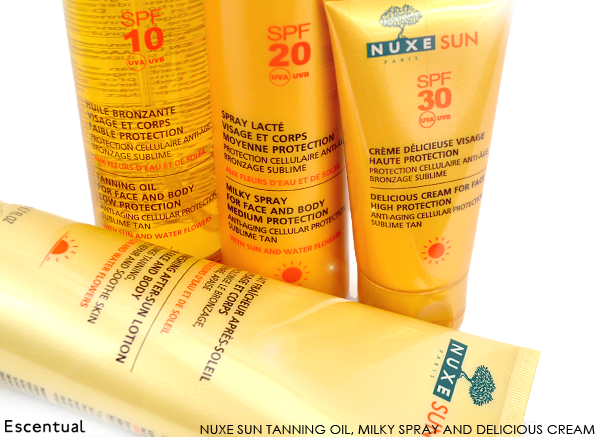 The Nuxe sun products would certainly help with standing in the sun all day. I’ve already ticked Cuba off my list (amazing, btw) so either Goa or Bali! I’d love to see the Aurora Borealis from the slopes of Eyjafjajokull volcano in Iceland. Yes, that would be a night time thing and therefore would not require any sunscreen….but maybe I could slap some on when I’m chilling at the Blue Lagoon geothermal spa the morning after? Morocco is my dream, so bohemian and beautiful. I’d love to lounge in the Moroccan sun. Hawaii to try the surf there, the sea looks heavenly! I’d pick a tour of Canada – looks gorgeous. Costa Rica. Jungles and beaches, the perfect destination! The Barossa Valley in Asutralia – saving like mad! I’d love to visit Vietnam – a tour of South East Asia is definitely my dream holiday! Zakythos in Greece, ive had the pleasure of visiting previously and loved every moment of it. My dream holiday destination is Italy. The views are beautiful and the food and wine sounds amazing. Ooh South America: Chile, Argentina, Brazil. And with lots of sun cream for me too! It has to be Malta for me! I have always wanted to go there. I want to go to Dubai! Oh yes! I have always wanted to visit Japan, as it’s so different from the culture I grew up in. My dream holiday destination will come true in June! Last year I won a competition and a gift voucher at travel agent! So now I’m going with my husband to Aruba and Curacao! St Kilda Beach, Melbourne, Australia! The South of France, my favourite place! Mykonos Greece, heaven on earth! Vianne in France. So quaint. My dream holiday destination would either be New York or Paris! I love city holidays! Has to be Sydney Australia where my grandchildren live. I’d love to go to Mexico! Santorini is definitely on my list of dream holiday destinations, it looks and sounds beautiful! Lisbon, Portugal! I just came back from Faro and want to see more of Portugal! A hybrid holiday in Oman, combining adventures in the desert with luxurious private beach resorts. Hello. I would love to go somewhere tropical. Like Hawaii or Jamaica. My dream holiday destination would be Venice, it’s a city that has always fascinated me. The Great Barrier Reef, Australia, staying on a tiny island. I think I left my heart in Mexico the last time I visited so it would have to be there. The friendliest people, most delicious food, sights, sun, music, culture – it’s got it all! I have always wanted to go to St.Lucia, it looks absolutely stunning! I’d love to go on safari in Africa, would be the trip of a lifetime! Silver sand dunes in Morar, Scotland. I will go to the beautiful Turkish seaside! In a hut on water in Bora Bora with a cocktail in one hand and a book in the other. My dream holiday destination would be PARIS!!!! I have always dreamed of going to vegas! Heading to my dream location of the Rocky Mountains Canada in a few months time. Can’t wait ! I would go back to Crete as it’s where I got married. Myself and my girlfriend went to Thailand and loved it so we would like to go there again. My dream holiday is Florida, luckily my dream is coming true next week eekk, I’m beyond excited! Great competition! My dream destination is Fiji. Somewhere I’d go if I won the lottery and could afford to travel to in style. My dream destination is Costa Rica! Would love to visit the Cayman Islands! Would love to go to New Zealand. New Orleans. Would love to experience the craziness! Las Vegas…and I’m lucky enough to be going in September! Mine would be any beach resort that has the blue blue water you see in holiday ads. I would love to visit the Caribbean! My dream destination is Antigua and hopefully going there in September! Australia – I would love to meet up with my Dad’s Brothers & Sisters who emigrated there in the Sixties. I have never met them so it would be quite a reunion! South Wales – always wanted to go there! I’d love to go to Hawaii. I would love to visit South Africa to go shark cage diving I am in awe of all sea-life & wild-life, afterwards I dream of ending up towards North Africa for a safari. Not a glamorous holiday but one I must do in my life time to feel my life has been completely full filled. Malta – a lovely place with beautiful weather and friendly people! I’d love to go to Istanbul! Florida so I could be a kid again!! Australia and New Zealand – to visit some dear friends! I adore Zanté – it’s such a gorgeous island with the most beautiful beaches. Fiji but any of the South Pacific islands will do!